Crumbs Cupcake Holiday GIVEAWAY! - Kosher In The Kitch! Crumbs Cupcake Holiday GIVEAWAY! - Kosher In The Kitch! Home / Giveaways / Crumbs Cupcake Holiday GIVEAWAY! Whoever says diamonds are a girls best friend, has never had a cream cheese frosted Crumbs cupcake. When my husband is running late or has to reschedule date night for something urgent that comes up, he knows better than to come home with jewelry or flowers. All he needs to do is take me to the godfather of all bakeries and treat me to one of those super moist and fluffy cupcakes topped with a rich layer of cream cheese frosting and suddenly, I’m a happy camper. I forget my anger while I lose myself in a sweet sugar coma. Now men, don’t get any ideas. You can only pull the cupcake card out maybe once or twice before the sugar rush loses it’s power, but those cupcakes are without a doubt the ultimate get out of jail card. Crumbs hasn’t stood you up, but they want to give the gift of sweetness this Hanukkah with a delicious 6 pack of signatures to one lucky reader! 1. Like “Kosher in the Kitch” on facebook, and leave a comment below letting us know you did. 2. 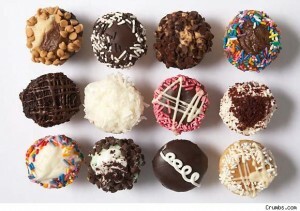 Take a look at the “Crumbs” website and let us know your fav cupcake! Please note, you need to leave a separate comment for each thing you do for it to count as a separate entry. This contest ends December 27th, 2011 Midnight EST. Open to US residents only. ** Crumbs cupcakes are Kosher, however they are dairy and are NOT cholov yisroel. Baba Booey looks divine, mmmm I’m glad there isn’t a Crumbs anywhere near me! black and white definitly. even though i wouldnt complain if i got any!! theyre all awesome!!!!!!!!!!!!! Peanut butter looks yum AND blackbottom cheesecake brownie! Like kosher in the kitchen and all the cupcakes look awesome!! I Like “Kosher in the Kitch” on facebook. My fav cupcake is Apple Cobbler. I liked you on Facebook months ago! I think I would like the Blackout cake the best, but I’ve never tasted them! I live in PA.
My favorite cupcake is the s’mores cupcake! Caramel apple is my favorite!!! Liked on fb- peanut butter cup would be my favorite =) thanks!! !